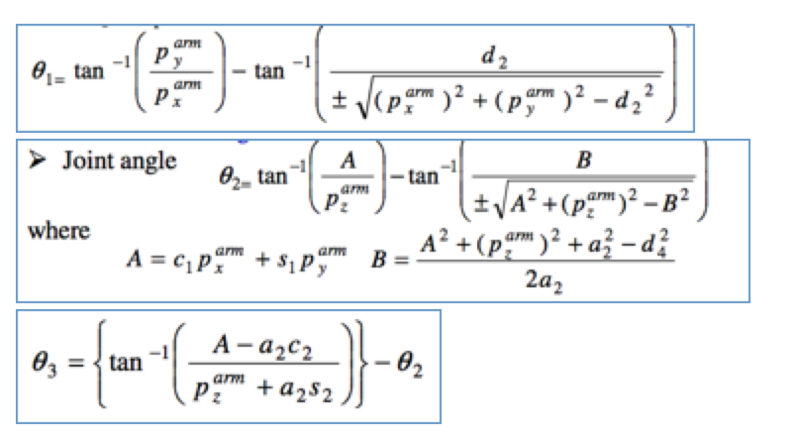 As seen in the equations theta 1 and 2 have 2 two roots (2 possible solutions) thus, the robot has eight groups of inverse kinematics solutions. How do I modify my code to select the ideal solution for theta ? Ideal solution can be defined in many ways. The simplest way to choose one is to compare which of the 8 solutions is closest to your current pose in joint space. This is usually a good idea if you are moving along a line (or similar defined trajectores). In practics some robot manufactruers have solved this using the status and turn variables. These variables are additional inputs for the inverse kinematics problem and specify exactly which inverse kinematics solution is needed. You can also check is one of the poses has a collision with the environmnent to filter infeasable poses. Not the answer you're looking for? Browse other questions tagged robotic-arm kinematics inverse-kinematics algorithm matlab or ask your own question.